You already know that taking proper care of your teeth means brushing and flossing every single day. 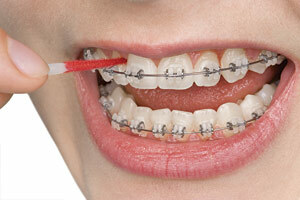 This simple routine seems to be overly complicated when you add in the twist of braces. How are you supposed to get your teeth clean when you have brackets and wires blocking the bristles and floss no matter which direction you come from? The good news is that brushing & flossing with braces is simpler than you think, and the professionals at Orthodontically Yours, who are conveniently located in both Mississauga and Thornhill, are here to answer all of your questions. What does it matter if a patient brushes or not while wearing braces? These orthodontic devices make it easy to get foods stuck on or close to your teeth. Unless the food is removed, bacteria can develop, which could lead to gum disease. Gum disease can weaken the teeth and lead to much more serious problems than misalignment. In addition, improper techniques could lead to stained teeth once the braces are removed. For treatment to reach the desired results, it is important to take extra care with your oral hygiene while wearing braces. While it is not necessarily essential, an oral irrigator can make proper maintenance of the teeth easier by dislodging food that gets stuck in small areas. Patients who do not have each of these tools can speak to the professionals at Orthodontically Yours. We may be able to provide the tool you’re looking for or offer suggestions on where to find it. Brushing sounds so simple, but the best way to keep teeth healthy is to do it the right way. It’s not enough to scrub at your front teeth for 30 seconds and call it good. Each individual tooth needs to be polished on the front and back. The chewing surfaces of teeth such as the molars also need to be properly cleaned. Use a soft-bristle brush, bi-level brush, or electric toothbrush set to moderate or low power. Make sure to brush your teeth twice a day for at least a few minutes. With braces, it is important to hold the brush at an angle tilted toward the gum line. This means the brush tilts down while cleaning the bottom teeth and tilts up when cleaning the top teeth. Use circular motions to polish the front and back sides of the teeth. For chewing surfaces, use a firm stroke back and forth. Don’t forget to use your proxabrush, sometimes known as a Christmas tree brush, to get between narrow areas of the braces. Flossing like normal won’t work when you have braces on. So how are you supposed to get that little piece of thread between your teeth and around the archwire? This is where the floss threader comes in handy. Put one end of the floss through the threader. Then put the threader under the wire and push it through. You can then grab each end of the floss and move it up and down. Keep this up until you hear a squeaking sound. Once complete, pull the floss out and repeat the process for the next section. In addition to brushing and flossing regularly, be sure to get in to see us for your regular Mississauga & Thornhill orthodontics checkup. You can contact us directly at (905) 820-6511 for Mississauga or (905) 763-9098 for Thornhill. You can also conveniently request an appointment online.